For the second year in a row, a team of Whitworth University students took second place at the 10th annual Northwest Regional Ethics Bowl, hosted Nov. 5 by Seattle University, in Seattle, Wash. The Whitworth team defeated teams from Seattle University, Cascadia College, Washington State University, and defeated rival Montana State University in a semifinal match. They lost a closely contested final match to the University of British Columbia. This year marks the ninth time in 10 years that a Whitworth team has placed in the semifinals or finals. In the past five years, Whitworth has been undefeated in the preliminary matches at the Northwest Regional Ethics Bowl, for a compiled record of 18-3. The Northwest Regional Ethics Bowl was one of 10 regional competitions held this fall as part of the Intercollegiate Ethics Bowl (IEB). 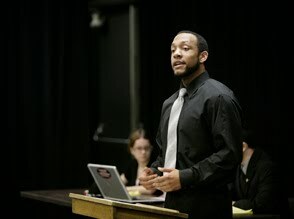 By competing in the final match, Whitworth has qualified for the IEB to be held on March 1, 2012, in Cincinnati, Ohio, in conjunction with the Association for Practical and Professional Ethics. Members of the Whitworth team include English major Bridger Landle, philosophy major Benjameen Quarless, and political science major Jesse Javana, all '12, as well as philosophy major Krister Johnson and political science major Max Nelsen, both '13. The team was coached by Mike Ingram, professor of communication studies and associate provost for faculty development and scholarship, and Keith Wyma, associate professor of philosophy. "I remain proud of our students and their ability to engage in thoughtful deliberation and exchange of ideas with their peers," Ingram says. "Judges and audience members commented on our team's poise and their ability to express themselves clearly and effectively." In the IEB, a moderator poses questions to teams of 3-5 students. Questions may concern ethical problems on a wide range of topics. Each team receives a set of ethical issues in advance of the competition, and questions posed to teams at the competition are taken from that set. A panel of judges evaluates answers; rating criteria are intelligibility, focus on ethically relevant considerations, avoidance of ethical irrelevance, and deliberative thoughtfulness. Prior to the Nov. 5 competition, Whitworth's interdisciplinary team analyzed 10 ethically complex cases pertaining to topics such as making voting compulsory, banning bullfighting in Spain, the expanding use of coal in the developing world, and changing privacy policies used by Facebook. In each round of the competition, a panel of judges posed a question about a particular topic; the teams prepared responses using reasoning, application of ethical theories, and cogent-policy analysis. The teams gave short presentations on their responses and then fielded questions from the judges. The judging panels include ethics professionals and practitioners as well as ethics professors. Organized by the Illinois Institute of Technology's Center for the Study of Ethics in the Professions, the IEB develops students' intellectual abilities and capacities, deepens their ethical understanding, and reinforces their sense of ethical commitment. The IEB has received a special commendation for excellence and innovation from the American Philosophical Association and was awarded the American Philosophical Association/Philosophy Documentation Center's 2006 prize for Excellence and Innovation in Philosophy Programs. The format, rules and procedures of the IEB all have been developed to model widely acknowledged best methods of reasoning in practical and professional ethics.